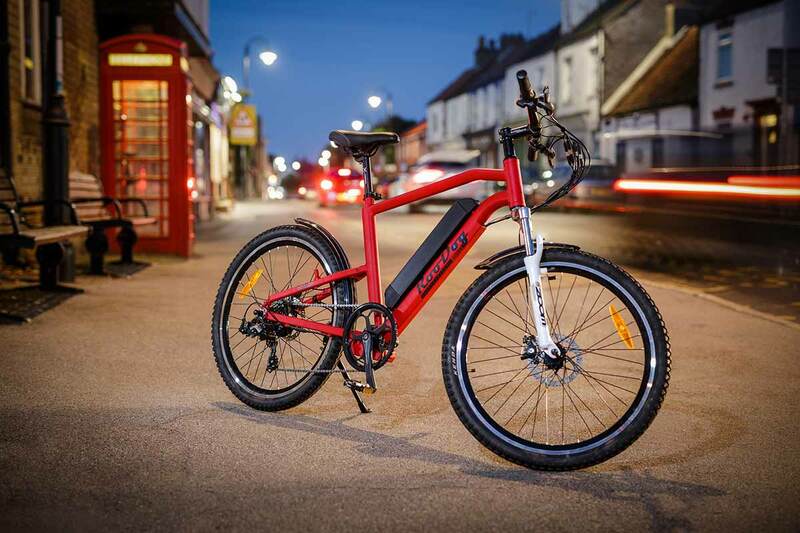 The Striker light weight electric bike is our lightest RooDog weighing in at just 19.9kg including the battery! The light weight economical design enables the Striker to ride beautifully with or with out power. A 250W 36V rear wheel hub brushless motor with a 36V 10Ah standard size lithium polymer battery. (Now with a maximum speed of 15.5mph which is allowed by UK/EU regulation). Shimano 7 speed Megarange manual gears. Kenda, 26″ x 1.95 mountain bike style tyres giving you the option to explore off the beaten path. The Striker 20 inch frame is made of light weight aluminium alloy 6061, making it super smooth comfy ride with or with out power. We would recommend that the Striker would suit a rider from 5’6ft to 6’3ft tall. The Striker will do 30 plus miles per full charge on level 5 (highest speed setting). Your range will increase dramatically on the lower eco levels. Dependent on weight of cyclist, frequent use of PAS, air pressure in tyres, road condition, etc. Continually using the throttle and/or hill climbing will significantly reduce the range of the battery. People come in all shapes and sizes our size guide is only advisory. The best thing to do is test them all out and see which RooDog is the one for you. Enter your postcode to find a dealer near to you. 30 plus miles per full charge, dependent on weight of cyclist, frequent use of PAS, air pressure in tyres, road condition, etc. Continually using the throttle and/or hill climbing will significantly reduce the range of the battery. Pedals only; Pedal assist is a combination of motor and pedalling. Our e-bikes come with a throttle fitted meaning no pedalling is required. Please note throttle speed is capped at 4mph by the UK regulation.